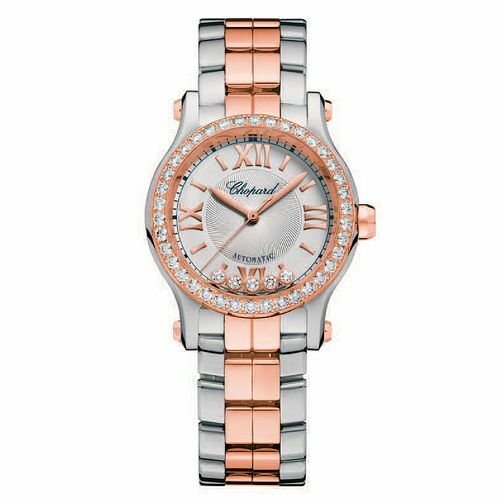 The Happy Sport 30mm Automatic sparkles with femininity. Stunningly crafted from 18-carat rose gold and stainless steel and adorned with a diamond-set bezel, the petite case on a two-tone gold and steel bracelet combines gentle curves and daring originality, perfectly capturing the Chopard spirit. Its silver-toned dial with a guilloched centre richly complements the Roman numerals and the timepiece's delicate details. Its five emblematic moving diamonds dance joyfully in a cascade of light.